According to a 2012 survey by research company Goo, Slam Dunk ranked second on a huge list of favorite manga out of the thousands of adults surveyed by the group. Surprisingly ranking only behind the all powerful One Piece but still beating timeless titans such as Naruto, Doraemon and EVEN Dragonball! More interestingly, the protagonist of SD, Sakuragi Hanamichi, ranked as number 4 amongst both female and male readers when asked who their favorite character was. Takehiko Inoue has, in my opinion, the best mix of “serious” and “goofy” tone in the history of comics, including American ones. Inoue can draw a stunningly detailed and emotional portrait of a human being in one panel and then do a 180 on that character’s facial features the next. And it works. Check out this page:. Notice how Inoue draws the protagonist, Hanamichi Sakuragi, with meticulous detail and realism in one panel. The next, he’s clowning/trolling his fat/old coach. 2: Slam Dunk captures the love of basketball. Here’s a panel of Hanamichi, a neophyte to the game, hitting his first layup, with help/guidance from his crush. The joy of hitting jumpers and layups is one all us young hoopers have experienced. 3: It’s about love — for the game, for the girl. The story centers on a high school delinquent who joins the basketball team solely because his crush asked “do you like basketball” (I did the same in high school, but for volleyball). The book then follows his initial dismissal of the sport to eventually loving the game. 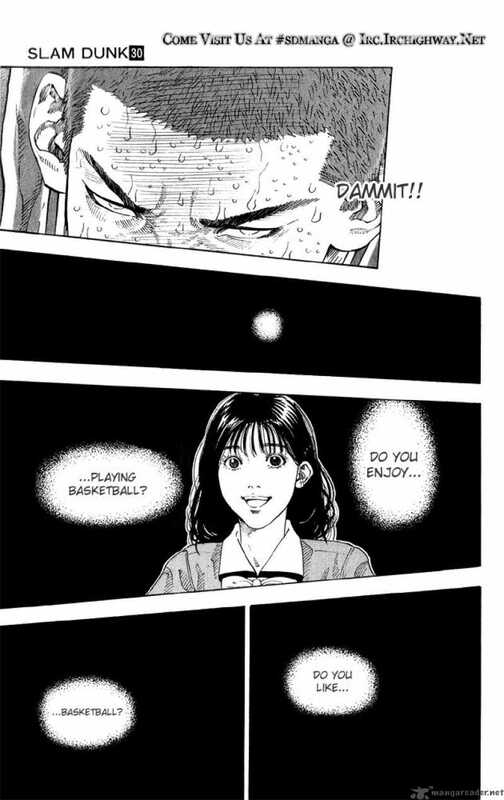 Here, in one of the final chapters, Hanamichi battles a potentially career-ending back injury, and it is here, he remembers the original question, “do you like basketball?”, to which he responds by professing his love, for the game, for HER, at once. This scene was powerful back in ’96, but now that I’m a grownassman? Even more so. This is a book on not just basketball, but love and life. 4: Slam Dunk gets sneakerhead/hypebeast culture. Check out this hilarious piece in which Hanamichi and his crush go shoe shopping. The owner of the sneaker store sums up sneakerhead/hypebeast culture with his rant against dudes who buy just to collect. Remember, this was 1995, before Hypebeast became the go-to website for all these wanna-be street-types today, like my flatmate. I’ve really only just scratched the surface. There are a hundred more reasons why Slam Dunk is so beloved, including a hilarious rivalry between the main character and his teammate, a handsome superstar with a huge female fanbase, and many other characters and subplots which has since become a crucial part of manga lore. This book is big in Europe too — it’s sold around 120 million copies worldwide — making it arguably the most widely-read manga around. This was a good read, brother.